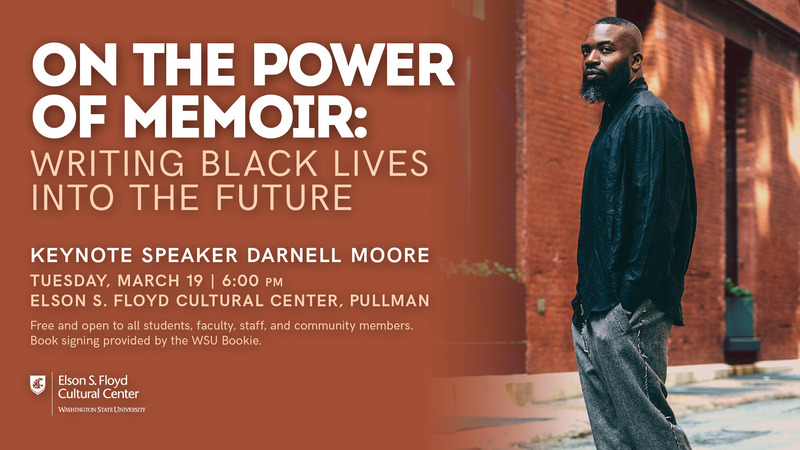 There will be a book signing and tasty appetizers to follow on the Pullman Campus. WSU Global Campus will stream the event from 6:00-7:00 p.m. PDT through a closed registration feed. If people from your campus would like to submit questions for the speaker, please make sure that you are connected to global connections link (and not the youtube link). Someone from Global Campus will monitor the chat for questions. I will be sure to frequently check in with the feed for TC, Van and Spokane questions. The set up for the event will be more of a dialogue than a lecture (per his request), so I anticipate lots of room for questions. Instead of him delivering a lecture at the podium, he will be seated with David Leonard, and Lisa Guererro and they will have a conversation about his work. Darnell L. Moore is the author of No Ashes in the Fire: Coming of Age Black and Free in America. He is currently Head of Strategy and Programs at Breakthrough US and is the former Editor-at-Large at CASSIUS (an iOne digital platform) and a senior editor and correspondent at Mic. He is co-managing editor at The Feminist Wire and an edi-tor of The Feminist Wire Books (a series of University of Arizona Press). He is also a writer-in-residence at the Center on African American Religion, Sexual Politics and Social Justice at Columbia University. Darnell’s advocacy centers on marginal identity, youth development and other social justice issues in the U.S. and abroad. He hosted Mic’s digital series, The Movement, which was nominated for a Breakthrough Series: Short Form Award at the 2016 IFP Gotham Awards. He has led and participated in several critical dialogues including the 58th Session of the UN Commission on the Status of Women; the 50th Anniver-sary of the March on Washington National Panel on Race, Discrimination and Poverty, the 2012 Seminar on Debates on Religion and Sexuality at Harvard Divinity School, and as a member of the first U.S. delegation of LGBTQ leaders to Palestine in 2012. A prolific writer, Darnell has been published in various media outlets including MSNBC, The Guardi-an, Huffington Post, EBONY, The Root, The Advocate, OUT Magazine, Gawker, Truth Out, VICE, Guernica, Mondoweiss, Thought Catalog, Good Men Project and others, as well as numerous aca-demic journals including QED: A Journal in GLBTQ World Making, Women Studies Quarterly, Ada: A Journal of Gender, New Media & Technology, Transforming Anthropology, Black Theology: An International Journal, and Harvard Journal of African American Policy, among others. He also edited the art book Nicolaus Schmidt: Astor Place, Broadway, New York: A Universe of Hairdressers (Kerber Verlag) and has published essays in sev-eral edited books. Darnell has held positions of Visiting Fellow and Visiting Scholar at Yale Divinity School, the Center for the Study of Gender and Sexuality at New York University and the Institute for Research in African American Stud-ies at Columbia University. He is presently Writer-in-Residence at the Center on African American Religion, Sexuality, and Social Justice at Columbia University. 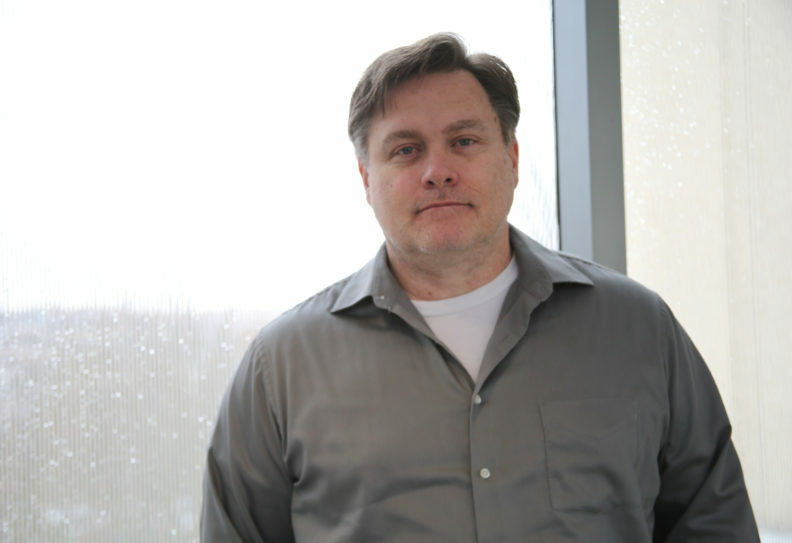 He has taught in the Women and Gender’s Studies and Public Administration departments at Rutgers University, Fordham University, City College of New York City and Vassar College. Darnell has also provided keynote addresses at Harvard University, Williams College, Stony Brook University, New Jersey City University, Stanford University, and the New School. Darnell received the 2012 Humanitarian Award from the American Conference on Diversity for his advocacy in the City of Newark, where he served as Chair of the LGBTQ Concerns Advisory Commission. He is the recip-ient of the 2012 Outstanding Academic Leadership Award from Rutgers University LGBTQ and Diversity Re-source Center for his contributions to developing the Queer Newark Oral History Project. He received the 2013 Angel Award from Gay Men of African Descent and the 2014 Gentleman of the Year Award from the Gentlemen’s Foundation. He was listed as a one of Planned Parenthood’s Top 99 Dream Keepers in 2015, was featured in USA Today’s #InTheirOwnWords multimedia feature on contemporary civil rights activists, was named among EBONY Magazines’s 2015 Power 100, Time Out New York’s Eight LGBT Influencers, Be Modern Man 100, and The Root 100 2016 and 2018. He assisted in organizing the Black Lives Matters Ride to Ferguson in the wake of Mike Brown’s tragic murder and along with Alicia Garza, Patrisee Cullors, and Opal Tometti (#BlackLivesMatter Co-Founders) developed the infrastructure for the BLM Network. Dr. Ashleigh-Jane Thompson, a Lecturer and Program Director within La Trobe University’s Department of Management, Sport and Tourism, will present a guest lecture entitled, “Performing in the spectacle: The 21st-Century Gladiator and the Modern-Day Coliseum,” 4:00 p.m. on Tuesday, April 2, in Cleveland Hall 30E. Social media have become pervasive parts of modern society, consumer culture and are now an important facet of sport communication. In this talk, Dr. Thompson will consider the growing importance of social media as a sport communication tool, share how athletes are negotiating and performing in this new arena, and the exciting new opportunities that make sport fans part of the spectacle. She will also discuss whether social media serves up the right results for stakeholders involved in a global sport like tennis. The good, bad, and ugly of social media in sport will be discussed at Washington State University Pullman by a professor from La Trobe University in Australia, in an open lecture at 4:00 p.m. on Tuesday, April 2, in Cleveland Hall 30E. 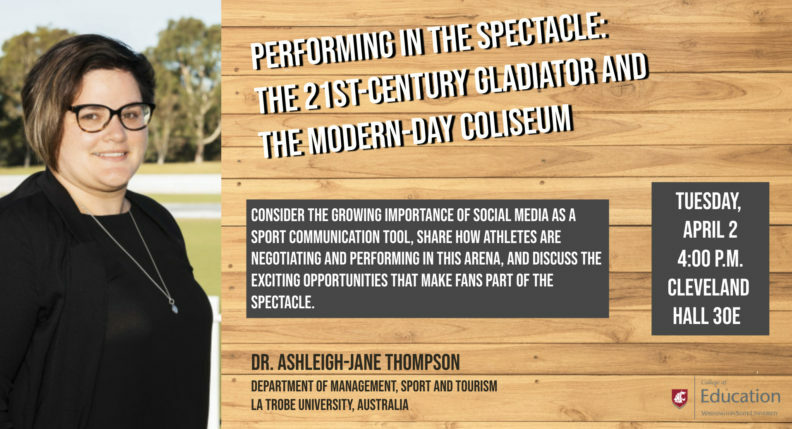 Ashleigh-Jane Thompson’s lecture, titled “Performing in the Spectacle: The 21st-Century Gladiator and the Modern-Day Coliseum,” will discuss the growing importance of social media as a communication tool in sport. “The strategic use of social media might help sport brands create an authentic connection with fans, and develop social bonds that are not easily copied by competitors,” said Thompson, who directs study programs in Sport Development and Management in the La Trobe Business School. Thompson studies the impact of communication between sport organizations, athletes, and consumers. If used correctly, social media allows athletes to cultivate their image and increase their potential endorsement value. However, when used incorrectly, it can cause irreparable harm. Thompson is originally from New Zealand, a sport-mad nation that often punches above its weight in global contests. “I’m hoping to share with you a view inside New Zealand’s unique outlook on sport, our idolized stars and the use of social media,” Thompson said about her visit to Pullman. Thompson has studied a range of sports including elite tennis, rugby, and cricket. She maintains connections within the sport industry and provides guidance to national and international sport organizations and events. “This presentation will be particularly valuable to people interested in social media and sport in university departments, Olympic sports, and beyond, who cannot count on league mastodons to provide detailed guidelines and rather need to rely on their own creativity and originality when using cutting-edge technology,” Licen said. Earlier on Tuesday, Thompson will present a guest lecture on alcohol and sport in New Zealand to students in a course on sport and popular culture. She studied alcohol advertisement in rugby and cricket world cups hosted by the island nation. The event is hosted by the Sport Management program in the College of Education. 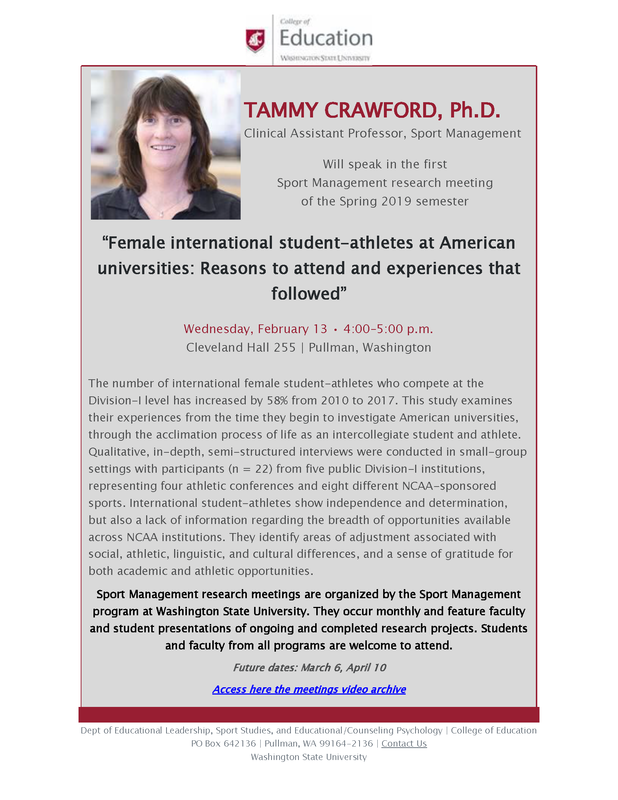 Tammy Crawford, Ph.D., a Clinical Assistant Professor of the Sport Management Program at WSU, will speak in the first Sport Management Research Meeting of the Spring 2019 semester. Her presentation, “Female international student-athletes at American universities: Reasons to attend and experiences that followed,” will occur 4-5 p.m. on Wednesday, February 13, in Cleveland Hall 255 in Pullman. The number of international female student-athletes who compete at the Division-I level has increased by 58% from 2010 to 2017. This study examines their experiences from the time they begin to investigate American universities, through the acclimation process of life as an intercollegiate student and athlete. Qualitative, in-depth, semi-structured interviews were conducted in small-group settings with participants (n = 22) from five public Division-I institutions, representing four athletic conferences and eight different NCAA-sponsored sports. International student-athletes show independence and determination, but also a lack of information regarding the breadth of opportunities available across NCAA institutions. They identify areas of adjustment associated with social, athletic, linguistic, and cultural differences, and a sense of gratitude for both academic and athletic opportunities. Sport Management Research Meetings are organized by the Sport Management program at Washington State University. They occur monthly and feature faculty and student presentations of ongoing and completed research projects. Students and faculty from all programs are welcome to attend. The next research meetings this semester will occur on March 6 and April 10. Those who miss the presentations but are interested in the topic can access the video archive of past presentations. Henry Evans, J.D., M.A., an Instructor of the Sport Management Program at WSU, will speak in the third and final Sport Management Research Meeting of the Fall 2018 semester. His presentation, “Esport Viewership and Participation Motivations,” will occur 4-5 p.m. on Wednesday, November 7, in Cleveland Hall 255 in Pullman. In 2017, over 80 million unique viewers tuned into the SKT-RNG Semi-final match during the League of Legends World Championship. Even more impressive are the more than 100 million players who log on to play League of Legends on a monthly basis. When these numbers are compared to traditional sport viewership and participation, it seems that eSports is beginning to dominate the market. Why? What makes eSports so exciting? This study investigated and compared the motivations for eSport consumption through the lens of the ERG theory of motivation in order to determine why eSport viewership and participation has grown and how eSports should be marketed to both viewers and participants. Jordan Hunter, a graduate assistant for competitive sports and special events at University Recreation and sport management student, will speak in the first Sport Management Research Meeting of the Fall 2018 semester. 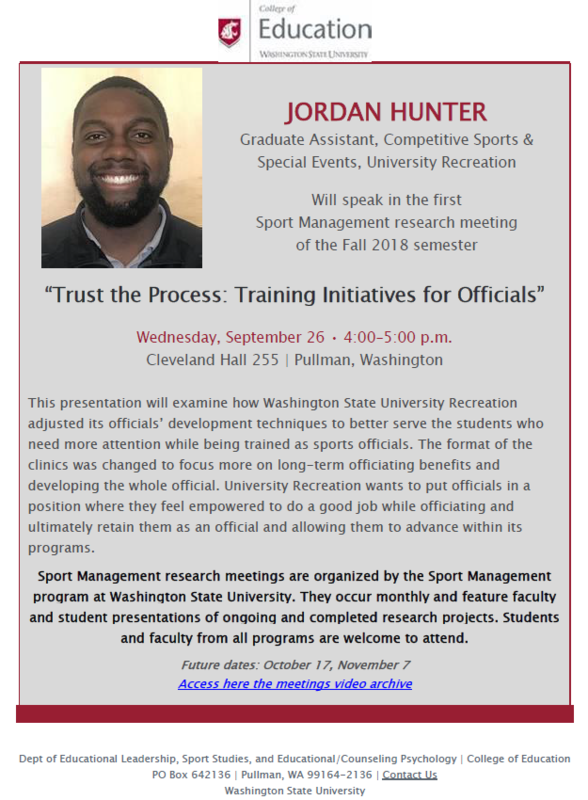 His presentation, “Trust the Process: Training Initiatives for Officials,” will occur 4-5 p.m. on Wednesday, September 26, in Cleveland Hall 255 in Pullman. 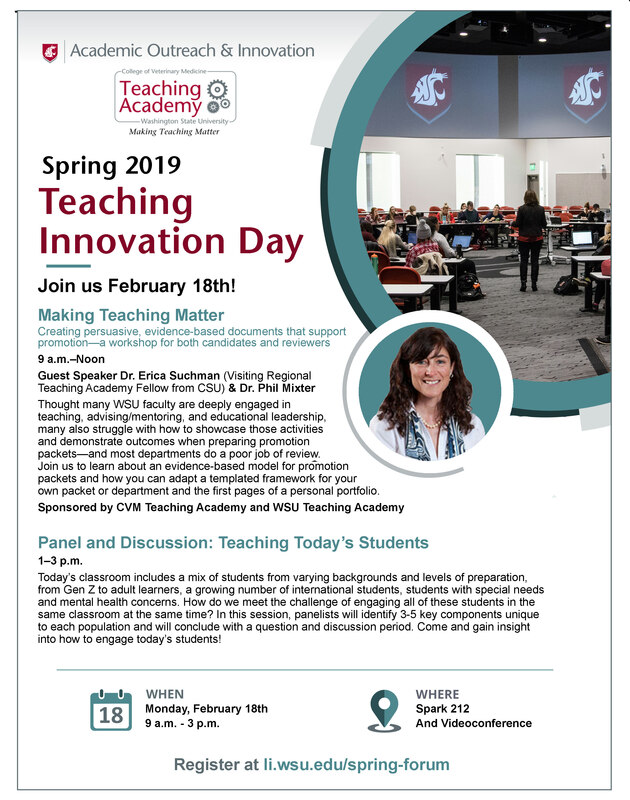 This presentation will examine how Washington State University Recreation adjusted its officials’ development techniques to better serve the students who need more attention while being trained as sports officials. The format of the clinics was changed to focus more on long-term officiating benefits and developing the whole official. University Recreation wants to put officials in a position where they feel empowered to do a good job while officiating and ultimately retain them as an official and allowing them to advance within its programs. The next research meetings this semester will occur on October 17 and November 7.